Blair Equipment Co., Inc. (Swartz Creek, MI), producers of precision sheet metal holemaking tools and spotweld cutters that are used in automotive body repairs, fabrication and restoration introduces two new Rotabroach Master Kits. Each of the new kits are an all in one set containing 16 different sizes of Rotabroach Cutters for drilling holes in materials up to ¼” thick. The fractional kit includes cutters from ¼” to ¾” and the metric kit includes sizes from 6mm to 20mm. Rotabroach annular cutters are ideal for use in metal fabrication, restoration, maintenance and electrical applications, spotweld removal, plugs holes for welding, and automotive aftermarket installations. Each kit is packaged in a sturdy plastic storage case and includes an arbor assembly, extra pilots, center punch, washers and instructions on use. Rotabroach Cutters can be used in hand-held electric drills with 3/8″ chucks and in drill presses. Rotabroach Cutters are made of M2 H.S.S., hardened and precision ground. The annular or hollow design cuts only at the periphery of the hole, leaving the center as a solid slug of material. Because there is no center point or “dead zone” as with conventional hole making tools, the annular cutter configuration has demonstrated the ability to drill holes up to 3 times faster and last 10 times longer than twist drills or hole saws. The cutters cut holes that are virtually burr-free and do not deform the surrounding material, even thin sheet metal. Rotabroach Cutters are made in the USA. 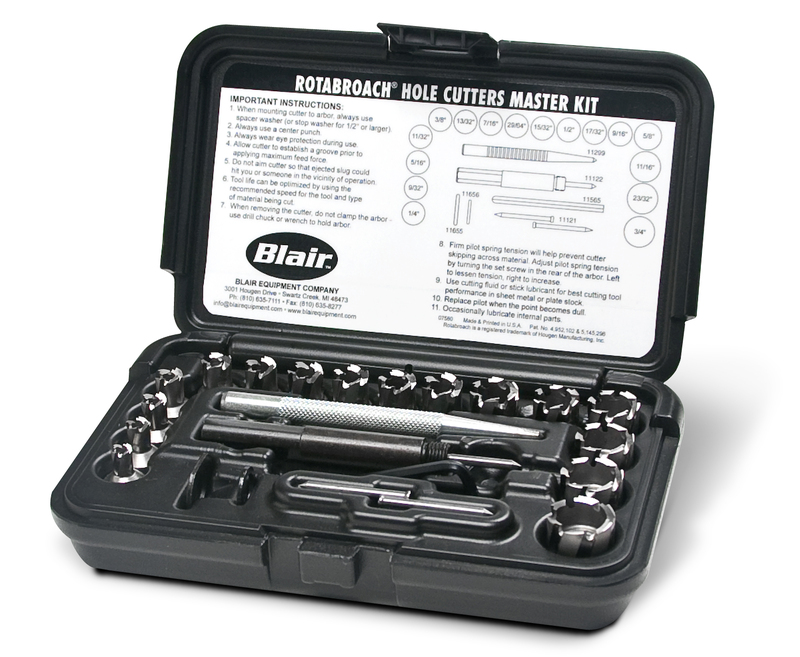 The Rotabroach Master Kits join Blair’s series of available cutter kits, including fractional and metric sheet metal kits and a large diameter Rotabroach Cutter kit with sizes from 7/8” to 1-1/2”. Blair also offers spotweld cutters and kits for auto body repair and restoration. For larger hole requirements Blair’s Holcutters are available in sizes from 11/16” thru 3″ for materials up to 1/8″ thick. Other tools include the pneumatic Enforcer Spotweld Drill and the Tornado IITM portable paint shaker which are used extensively in collision shops throughout North America. For additional information regarding Blair products, visit www.blairequipment.com.